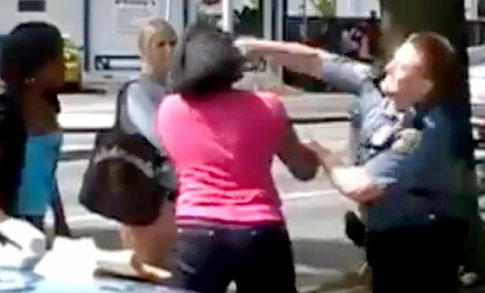 Controversy is gripping the Pacific Northwest after a police officer in Seattle, Washington, has been caught on tape having punched a woman in the face during what should have been a routine ticketing for jaywalking. After seeing a man illegally cross the street while not at a crosswalk, the officer approached him. As that happened, he saw four women do the same illegal crossing. The cop told the women to approach his car, they became antagonistic, and the rest is captured in a very annoying video in which the women resist arrest and the cop pops one of them in the mouth for pushing him. First and foremost, you don’t push or lay hands on a cop and not expect to catch the business end of the nightstick. You simply don’t resist arrest like this woman did, and you definitely don’t push on and try to pull away from the cops, because if she was a guy and not a teenage girl, you get tazed for that business. If anything, these women are getting off light for their physical aggression towards a cop; there are a lot of fake crimes out there, but these women broke the law multiple times. “He did nothing wrong,” said police union official Rich O’Neill in the Seattle Post-Intelligencer. “If anything, I think he maybe waited a little too long to engage in force because I think he was trying to defuse the situation.” Weirdly, I think he’s right. The cop let the situation get way too out of hand. Plus, if anyone deserves to get roughed up for their stupidity, it’s someone dumb enough to jaywalk right in front of a cop.